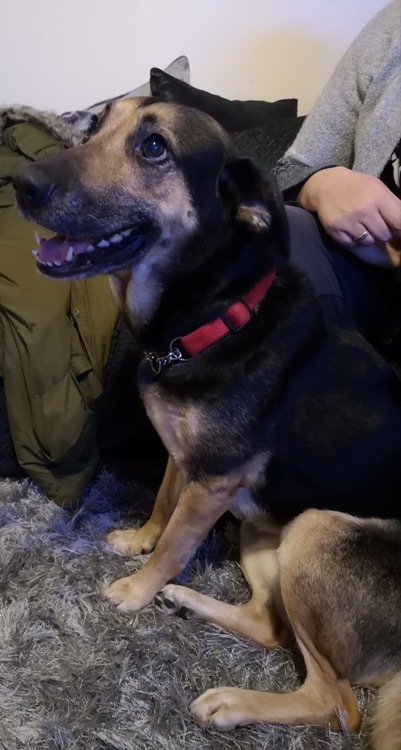 Stella is a 9 year old, German shepherd cross female looking for a new home as her owner has been rehoused in to a property that doesn’t allow pets. She is entire so will need spaying between seasons. Stella was calm and relaxed when our assessor visited her. She greeted them with a wagging tail and enjoyed a fuss before settling down to relax. She has lived around children so could live with them again especially if they are willing to play fetch with her! Stella can be fussy on which dogs she likes but could possibly share her home depending on a successful meet, however she’d be just as happy to have her new home all to herself. She is ok with dog savvy cats when introduced correctly. She is used to being left up to 4 hours and is a good girl while she waits for her family to come back. Stella loves her walks and is happy to travel in the car to explore further afield. She walks ok on the lead with a bit of pulling to begin with but settles once she’s got going, her current owner doesn’t let her off lead but their relative does and does come back when called. She is food motivated so recall could be worked on using tasty treats! Don’t be put off by Stella’s age, she is still an energetic dog but with the wisdom to know when it’s time to sleep as well. She will make a great addition to a family, are you the one for her?